Experience the evolution of vacation travel - stress-free country living at this one-of-a-kind Texas Hill Country home. Situated among centuries-old live oaks on a mile of San Gabriel River frontage, 172 acres of working farmland, and full of history. This Georgetown ranch is sure to captivate the whole group with its stunning views, terraced patios and original charm. Throughout this thoughtfully designed home, you’ll marvel at unique touches that speak to its special appeal. From the hand-laid stone pulled from the river, to the 5-tiered waterfall out back. You’ll even find framed reproductions of art painted by previous owner and artist C.P. Montague (who happened to be one of President Lyndon B. Johnson’s favorites) decorating the walls. The open living area offers plenty of air conditioned space to catch up with friends, while the gourmet kitchen provides all you need to prep family-style meals, including a dishwasher for easy clean-up. 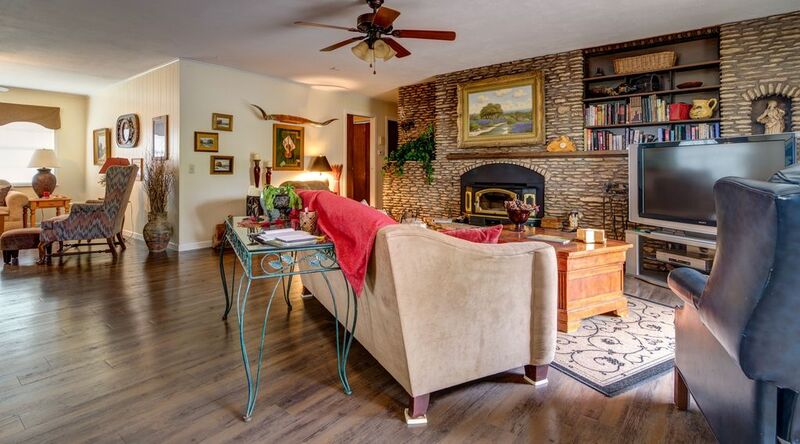 Curl up with a book by the wood-burning fireplace (wood provided), host family movie night on the 60” flat screen TV and DVD player, or stream your favorite show through Wi-Fi on your devices. Two luxurious king suites come complete with light-filled sitting rooms and beautiful linens, while a queen sleeper sofa in the living alcove or a 22” queen self-inflatable mattress with comfy bedding creates room for up to 6 travelers. If you brought the little one, a Pack-n-play and high chair are available too. An entertainer’s paradise lies just outside! Relax with a glass of wine on multi-level terraced patios while listening to the soothing cascading waterfall, or the fountain in the pond below. Fire up the charcoal grill and large smoker and dine alfresco with the whole group. At dusk, a fire pit awaits for story swapping, S’mores making, and stargazing. Just 10 minutes down the road is historic Georgetown, with "The Most Beautiful Town Square" in Texas", museums and live music. Wolf Ranch in Georgetown is a destination shoppers delight; shopping at IKEA and the outlet mall is just 20 minutes away; and you’ll be in the heart of Austin in 30 minutes. Or stay close to home and find great fishing and tubing in the San Gabriel River, along with 172 acres for hiking and birding. Be sure to check out our farm tour where the whole family can learn about local fossils, search for arrowheads, engage with the animals, or take tractor rides. Don’t forget your pets! Open acres of leash-free space are a dog’s dream come true. Ditch the city life for the serenity of the Texas Hill Country countryside and come see what it’s like to live on a working farm and explore a living museum! Dan and I both grew up in Rockdale, a small town 45 minutes from Georgetown. I grew up in the country on a small 3 acre farm and Dan grew up in town. We were childhood sweethearts and both attended Baylor University. I have loved furnishing and decorating the homes for our guests. I continue to do a lot of the landscaping and taking care of the general upkeep of the homes. We love to travel, garden and I am an avid reader. Since I have retired I have more time to volunteer. Dan is always busy working on something on the farm - he will never be bored! Our youngest son, David, was 6 weeks old when we moved to the farm and he and his family live on the farm. David chose a homesite along the bluff and built his home. David is a Georgetown motor officer, so if you see a police motorcycle on the drive, there is no problem - it is just David coming and going! Our oldest son, Daniel, sold his IT business in Dallas and moved back to the farm this week! He and Sherry are avid gardeners and cooks/chefs. Look for more coming news about events held at the farm. When my mom and dad bought this beautiful piece of property, they gave each of their 5 children the option of building a home at a location of our choosing. Dan and I jumped at the opportunity and were the only ones to take them up on it. We moved to the farm in 1971 and built our home in 1977. After my dad died in 1986 Dan and I began buying the farm. When my mom died in 2010, she left her home and art studio to us. We've raised our family here and made the same offer to our two sons and our youngest took us up on it and built a beautiful home for his family in the middle of the property. Our oldest son can't wait to retire and return to the farm! Rocky Overlook and The Palette Pad are the heart of the farm and I could not even think of selling them. I didn't want them to fall in disrepair from not being used, or vandalized. Both are so unique that I wanted to share them. My sisters helped me and we totally remodeled the interiors of both and the results have been spectacular. It has been so gratifying to share my parent's dream home, history, and talents with others. In each house, I have a notebook with the story of their searching for and finding the property and building the houses. Also, the story of mama's painting and how she became C. P. Montague and a favorite of President Lyndon B. Johnson. The joy and appreciation that guests have when staying there are a living tribute to mama and daddy! This large, open home was designed around centuries-old live oak trees. It is constructed of river rock, every rock was picked up at the river on the property by Sheron's parents, Bill and Pauline Thweatt. Guests have marveled at how the rock was laid - all of the grout exactly the same depth and smoothed, and the lines of rocks precisely straight. Mama laid all of the rocks that show on the front of the houses and the interior rock fireplace walls. Daddy laid rock on the back and sides where they would not be as visible! The artist in her had to have the very straight, precise lines!! There are special rocks interspersed with the river rocks and mama could tell you a story about each one. I am sorry I didn't write those stories down. Bathroom 1 is large and can be accessed through a connecting door to the Country Cottage bedroom or through a door into the hallway. It has a white square tub and a beautiful oil mural of a Texas landscape with a river running through it with limestone bluff and rocks, spreading live oaks and yellow wildflowers - very similar to the San Gabriel River that borders the farm. Two separate sinks and mirrored areas, large walk-in closet. Bathroom 2 is in the Royal Suite and has a very large walk-in shower. Both bathrooms have large spa quality towels and walk-in closets. Only 10 minutes away from the "Most Beautiful Town Square in Texas". Visit the Visitor's Bureau on the square and get a walking map or enjoy one of the many great restaurants and shopping. Enjoy the quiet as you sit on the patios and see the horses and baby goats across the fence, deer at the bottom of the bluff, the hawks and many humming birds, or hear the owls calling at dusk. The farm has 1+ mile river frontage along the San Gabriel River, which is accessible to guests. Two great fishing holes, hundreds of fossils in the limestone banks. Great tubing and kayaking. The river can't be seen from the house, but the home sits on 172 acres with 1+ mile of river frontage, a short walk away. Large front load. Limited amount of laundry detergent provided. Circular drive in front. Please do not park on the lawn. Garage for storage, trash cans. Plenty of luxury towels - spa quality Beach towels and towels for your pets after enjoying the river. Wood stove insert in fireplace - see photos. This will totally heat the entire home, so be careful not to build one too large, or it will run you out! Enjoy smaller, romantic fires. Many books in living area and both bedrooms. Many more in chest in Royal master suite. There is a toy box in the garage, along with a box of "dress-up clothes" for little girls. Large lawn and play area for children, soccer, etc. There are many golf courses within a 15 - 20 minute drive of the farm. If you would like to have the refrigerator stocked when you arrive, I can do this for you. $20 an hour plus actual cost. Excellent stay on the farm! We stayed in the Rocky Overlook rental. Once we were settled in Sheron stopped by to say hi and deliver fresh baked Banana nut muffins. To say delicious is an understatement they were great! I can’t say enough good things about the owners Sheron and Dan. They made you feel right at home on the farm and Dan help get our car started when we drained the battery down one night. The house was Beautiful and had everything you needed for an enjoyable relaxing today . We had a great time going to the river every evening to soak our feet in the cold water after long days at the state parks hiking. I even took a quick swim one evening. One of the reasons we picked the farm was they are dog friendly. Our dog had the best time running around, swimming in the river and watching all the cows, goats and horses. They have two wonderful dogs, Jack and Jill that our dog loved playing with. We will definitely come back and Thank you Sheron and Dan for a wonderful stay!! I loved hosting you, Reese and Hazel! The farm is a perfect spot to do day trips to a lot of different parks and I know y'all hiked many miles last week! The river is really flowing again as they are releasing more water from Lake Georgetown as they are worried we might get more rain. You are welcome anytime! Did Reese try the Banana Nut muffin recipe? They are also our favorite! Plenty of everything (space, towels, linens) for a wonderful get away or vacation and beautiful outside surroundings! Our group of 8 ladies had a great time! I'm sorry I did not get to meet you and your friend when you visited. I know you had a great time visiting Salado - too bad the weather was so bad! Thanks for leaving everything so neat and tidy. You are most welcome to visit anytime. Perfect location for a staycation! This property is wonderful. There is so much to do that you never need to leave to go anywhere else! It was a pleasure hosting this family! Loved your well-mannered girls. Too bad we had so many rainy days during your stay! Come back anytime. We had a wonderful time with family. My husband, myself, our two teens and our yorkie stayed the weekend of Sept. 7th-9th and then my mom, my sister and my niece stayed with us 13th-16th. We had an amazing time with family. My son had a fishing championship at Lake Stillhouse and it allowed for him to pre-fish the weekend before and spend some much needed family time. Sheron is a gracious hosts and made us feel comfortable and at home. Sheron gave us a tour of the farm our first day there and showed us the river. We enjoyed Sheron's homemade banana nut muffins, they were delightful! It rained almost everyday, but my son, daughter and niece were able to enjoy fishing and playing in the river the last day we were there. We had the best time and to make it even more fun, my son won the fishing championship!!! We are so grateful for our stay and all the memories made at the Rocky Overlook. Thank you so much Sheron! Thanks for the great review. I am thrilled that Zane won the championship - how exciting for the entire family!! I am so glad the tournament was the week it was, as the next weekend we had lots of rain, and it probably would not have been much fun fishing. Please come back anytime! Quiet stay in the country! Had a blast! The view from the kitchen was exquisite! Plenty of room in and outside the home! Children spotted a 'real live frog' as they called it...they looked, squealed with delight and actually named it Hoppy! Armadillos loved what we were grilling and came extremely close to the patio.......Deer and fawns were also spotted along with a small herd of cows...all this right at the back! Beds were sooooooo comfortable.....the original air mattress had a leak and Sheron took care of it right away...….The tour given by Sheron's son was truly entertaining...the kids got a souvenir horseshoe they may have left.....the male adults enjoyed everything so much that they have already planned another trip for the holidays….IMPRESSIVE SCURLOCK FARMS!!!! I am always thrilled to hear the different things guests enjoyed during their stays with us at Scurlock Farms! Last weekend a guest that stayed there spent a lot of time with the fire pit down on the lower patio near the water fountain. She commented an armadillo family visited her every night and she got a couple of good photos. I'm glad they visited you for dinner. The tours of the farm are a favorite of guests and I am glad your family enjoyed it! I look forward to having your family back for Thanksgiving. Wonderful! We loved the house, each room was so unique and comfortable. The entire family loved the river, cows, and just hanging out on the back patio. The patio for the month of June and July was so nice with a constant breeze. It’s hard pleasing four teenagers but they all loved it here. We were made to feel welcomed upon arriving and never had a need for anything, thanks to our host hospitality! I am glad the entire family, including the teenagers, enjoyed staying with us at Scurlock Farm! We had a recent family that said their girls were "total city girls", but they didn't want to leave the farm. There is so much to do on the farm, and we are only 10 minutes away from many fun things to do and see in Georgetown and only 25 - 30 minutes from Austin. Come back to see us in the fall or spring when you can enjjoy the fire pit and the fireplace! Check out our other properties on the farm: Light Filled Artist Studio - The Palette Pad 322820 and Indian Bluff 3732945. Our setting will capture your attention and inspire you. Located 10 minutes from Southwestern University in Georgetown and only 30 minutes from Austin, you are close to all the recreation activities you desire. Rent a kayak or stand-up paddle board at Georgetown Paddle Company, 4405 Williams Dr. They will deliver it to the lake for you! Georgetown's historic Square - voted The Most Beautiful Town Square in Texas! Festivals and events around the Square - Red Poppy Festival in April, Halloween Spook House, carnival and hayride, Christmas Stroll in December. First Friday and Saturday on the Square. The Square is closed off and fills with booths of all types. Stores stay open late. Live music. The downtown splash pad is located just off the Square, outside the Georgetown Art Center at 816 S. Main Street. It is free and open for the summer! Blue Hole is a scenic lagoon on the South San Gabriel River. The entrance to Blue Hole Park is located at Second Street and Rock Street, one block west of N. Austin Avenue. This scenic park lined by limestone bluffs is a good wading spot to cool down a little bit in the summer. Take your tubes and enjoy the deeper water above the dam. $245 per night, $1470 for week, $4500 for one month. $20 per person over 6 per night Rocky Hollow is a great value for a small wedding venue - ask about pricing, family celebrations or for 2 or 3 couples vacationing together. There is no sales tax.